The price of general liability insurance and the ongoing shortage of carriers willing to write such policies for builders pushed these issue to the top of NAHB's annual critical issues surveys. On a scale of one to five, where one equals not at all critical and five equals very critical, general liability insurance cost scored 4. A sense of place matters just as much to luxury home buyers as the details of the floorplan and the quality of the finishes. 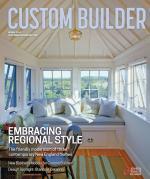 To deliver on this desire, custom builders can borrow a page from their production builder counterparts. Here Terry Smith of architecture firm Bloodgood Sharp Buster gives a quick tutorial in creating a community theme.